If you've ever searched for a gem to match one that you already own -- say, for a pendant or earrings -- you know just how difficult a search it can be. In the world of fine gemstones, most gems are one-of-a-kind, especially in larger sizes. The search for a matching stone usually ends, sad to say, in frustration. 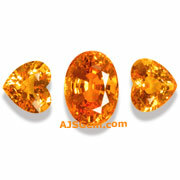 The most opportune time to match up gems is when a parcel of rough stone is cut. Sometimes a parcel of similar material will yield a matching pair without much sacrifice of weight. Very occasionally a more elaborate suite is possible, with matching stones for ring, pendant and earrings. Our practiced eye is especially evident in the unique gemstone suites we've created. These range from earring sets to ring/pendant/earring suites to elegant necklace layouts, with many featuring creative combinations of gem varieties, colors or shapes. All have been carefully matched up by our staff. They include many gem varieties, from inexpensive semi-precious sets to fine ruby, spinel and tsavorite and spessartite garnet. Rare gems are even more valuable when found in a matching suite, and they make wonderful gifts for someone special. This month we feature unique gemstone suites from our collection. A perfectly matched suite of fine Imperial Topaz for a pendant and earrings. These long elegant pears are a bright golden orange and completely clean. 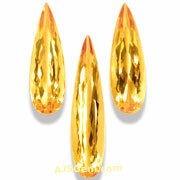 The pendant stone is about 35 mm long, while the matched pair are about 27 mm in length. Guranteed natural and untreated. An impressive necklace layout of 8 well-matched Ethiopian Opals! 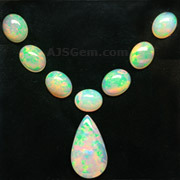 The large pear shaped opal is 15.60 carats (22 x 15.76 x 8.29 mm). The 7 smaller opals average 3.35 carats each. These fine opals display excellent color play, with a full range of colors. Guaranteed natural and untreated. An exquisite matched set of African tsavorite garnets and Burma rubies. 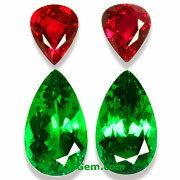 The 2 tsavorites have a total weight of 2.75 carats while the the 2 rubies total 0.79 cts. These will make a unique and beautiful pair of earrings for someone special. Guaranteed natural. A fine matched suite of spessartite garnets for ring and earrings. Bright and vivid color with full fire. The large oval is 3.28 cts (9.50 x 6.90 x 5.30 mm) while the matched pair of hearts is 2.67 cts total (6.69 x 6.17 x 3.65 mm). Guaranteed natural and untreated. A matched set of 5 gem silica gems from the top mine in Arizona. These blue-green pieces exhibit very good translucency. The large trillion is 5.69 cts while the oval is 5.46 cts. Guaranteed natural and untreated. 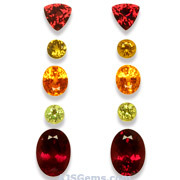 A 10 stone earring suite of three types of garnet -- 4 spessartites, 2 rhodolites and 4 mali garnets. 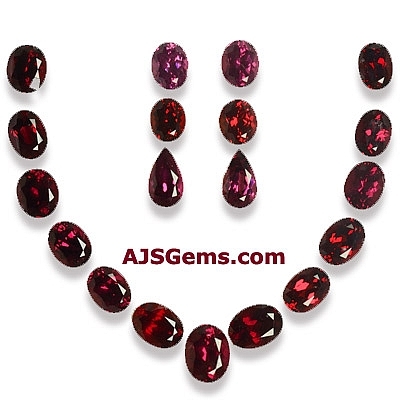 The large oval rhodolites are 3.91 cts each. Guaranteed natural and untreated. Two important records were set at the November auctions in Geneva. The 8.62 ct Graff Ruby owned by collector Dimitri Mavromattis was sold for $8.6 million at Sotheby's, setting new records both for a single ruby and for ruby price-per- carat. The buyer was Lawrence Graff, who had originally purchased the ruby at auction in 2006 for $3.6 million. The 392.52 ct Blue Belle of Asia, a cushion-cut Ceylon Sapphire, sold for $17.3 million at Christie's, setting a new record for sapphire (but not sapphire price-per-carat). A 9.75 ct Fancy Vivid Blue Diamond from the collection of Mrs. Paul Mellon sold for $32.6 million at Sotheby's November auction in New York. It set a new record for a blue diamond and a price-per-carat record for any diamond. The Mellon collection brought in a total of $228 million, more than doubling the presale estimate of $100 million. A transparent gem allows most light to pass through. A translucent gem allows some light to pass through, usually with significant scattering or diffusion of light. A material which does not transmit light at all is called opaque. Transparent gemstones, such as high quality ruby, sapphire, spinel, topaz and garnet, are graded with clarity terms such as eye clean and almost loupe clean, since it is possible to see into the interior of the gem. 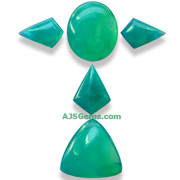 Translucent gems such as gem silica, jadeite and moonstone are usually graded simply as translucent. Though it is not possible to see into the interior of these gems, they often have a distinctive glow resulting from their translucency. In the gem trade, it is recognized that certain gemstones may have a tendency to be dark and overcolored, especially gems like blue sapphire, rhodolite garnet, tsavorite garnet and chrome diopside. When we say that a particular gem has an open color, we usually refer to a specimen of one of these gems which has good transparency and a bright color, where the color is obviously expressed rather than held inside the stone.